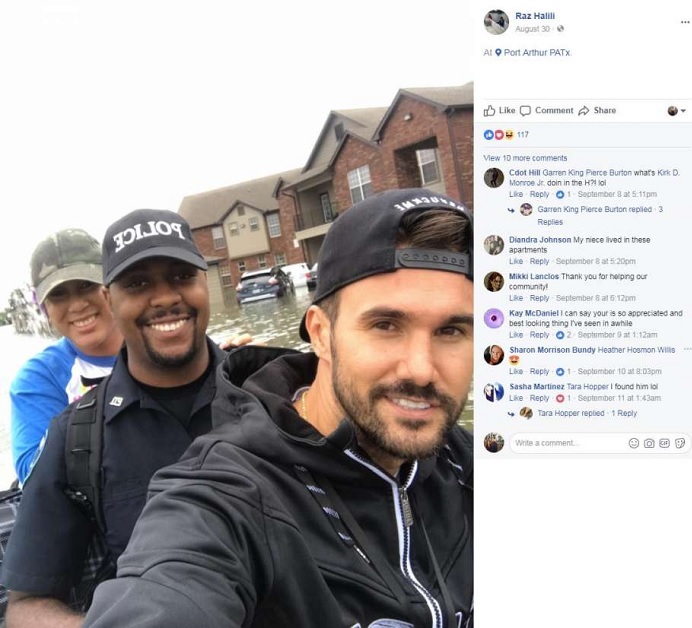 The 31-year-old Albanian Raz Halili, won the title "The Savior" for his contribution to saving people after the Harvey storm, which struck the Houston city. Foreign media write about the 31-year-old Albanian, of how Halili with his watercraft saved many people evacuating them from flooded areas. Raz Halili, is a Texas resident, and volunteered to save lives in areas flooded by water that caused Hurricane Harvey. A Texas resident wrote Ariel Marine's name on Facebook, sharing Halil's viral photos in order to find it. "I'm in love with you MAN!" Wrote with a hashtang a girl, who was rescued by the Albanian. Texas-born Halili told the Daily Mail that he and his cousin Gezim began helping to save people from the water. "The worst of the destruction we saw was in the Port Arthur area, the homes of the elders were overwhelmed, patients waited to be removed and sent to safe areas. Many homes, apartments, were completely flooded. Throughout this madness, there were many others who helped along with local state officials. It was nice to see people who helped others out of heart's goodness, regardless of race, religion, or political party, "Halili said. "I believe this is the true spirit of America. In all this catastrophe, it was a great pleasure that I was able to help after Hurricane Harvey destroyed everything. "